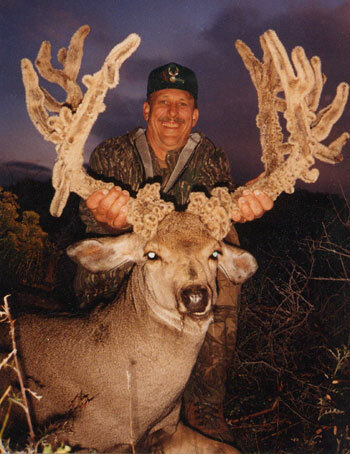 Jim Tonkin of Morgan Hill, California, shows off the buck he took in the Paunsaugunt area of Utah in 1994. The buck's rack measured 31 inches wide, 20 inches high, with 15-inch bases and had 40 points and over 100 little points. The buck scored 276 5/8 B&C and 278 7/9 SCI.